Your cat’s unique personality brings something very special to your home, adding joy to your lives. 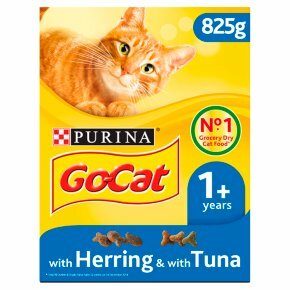 And that is why every product we make comes with the Go-Cat® Promise, our commitment to you that always guarantees: -A range of great tasting products: so there is something you cat will always enjoy. -100% complete and balanced nutrition including high quality proteins, fatty acids, vitamins and minerals that supports your cat’s health, vitality and happiness. -Made by Purina experts using over 85 years of experience in pet nutrition. 100% complete & balanced. Contains Fibres from natural sources to promote a good digestion. Healthy teeth and bones supported by essential minerals and vitamin D. Toned muscles supported by quality protein. No added artificial colours, flavourings or preservatives. Our cats are natural explorers, alive to everything in their world. It's what makes them such fascinating members of the family and brings so much vitality to our home. That's why Purina® Experts have created Go-Cat® for adult cats: delicious quality cat food to nourish your explorer's endless interest in his world. Go-Cat ® has been feeding cats with good, wholesome nutrition for decades. We fill millions of bowls and this honour comes with great responsibility. That's why Go-Cat® recipes are made with no added artificial colours, flavourings or preservatives. So you can keep feeding them the same tasty food they love and feel proud about it. With Go-Cat®, the world of discovery starts with the right food to support your cat's vital functions: 100% complete and balanced nutrition Contains fibres from natural sources to promote a good digestion Go-Cat® provides your daring explorer with all the nutrition he needs and the great taste he loves, to nurture his constant discoveries and help keep him healthy and happy. Daily Feeding (g/day) Fresh, clean drinking water should always be available. Sufficient consumption of water is a necessary part of healthy, every day nutrition. The adult maintenance averages are based on moderately active cats at normal environmental temperatures. Individual needs vary and feeding should be adjusted as required to maintain your cat at a lean, healthy body weight.